Nara is a little town known for its temples and deer park. Although I wasn’t particularly interested in seeing more temples, such towns often offer more of a cultural atmosphere of the real Japan as opposed to cities. It used to be the capital of Japan at one point. Nara is 45 minutes away from Kyoto by train and costs as much as my one way commute within Tokyo. The scenery on the way there was lush green and I got a glimpse of the Japanese countryside on the way. Houses got more traditional as I moved further away from the city. I got to my hostel in Nara to find more interesting travelers to talk to and a very well set up common room where I spent a lot of time. I met people from Australia, the US, Denmark and Hong Kong. I wished I was spending more than one night in Nara, just so that I could spend some more time hanging out at the hostel. Nara in general was a quiet place apart from the tourists there, and it struck a good balance between a developed place and a cultural one. Its definitely makes a great getaway. 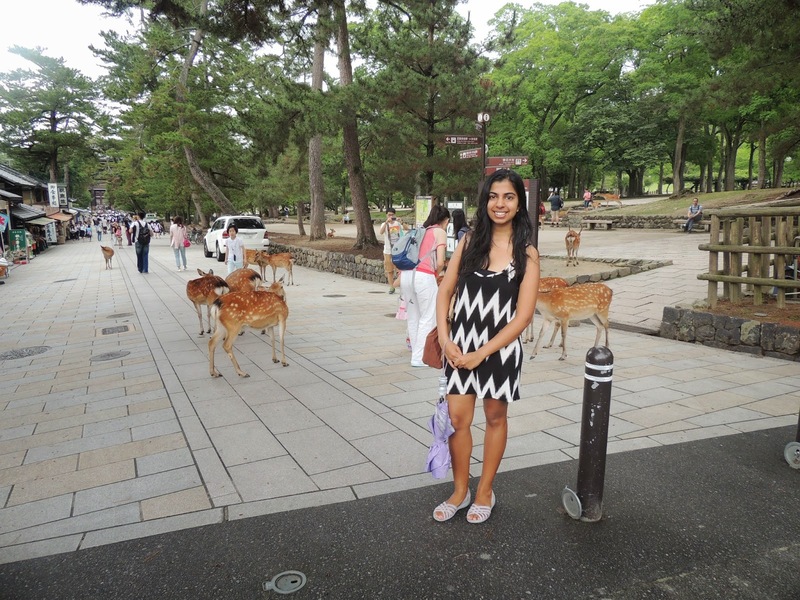 I spent my time in Nara at the Nara park (AKA the deer park) and the Todaiji temple. The bus system in Nara is great, and its very easy to get around the tourist places using a circular bus service. The deer park was beautiful. There was moss growing on the side and it was a great place to walk. The deer were fearlessly walking around, getting close to the people who offered them food. Deer biscuits were being sold at several stands in the deer park. Apparently, there is an antler cutting ceremony that occurs every year to ensure that the deer aren’t able to harmfully attack tourists. As a part of the deer park was the Kasuga-taisha, a shrine that is a UNESCO world heritage sight. Nara Park: The fearless deer roam freely in the souvenir shopping and food street that runs from Nara Park to the Todaiji Temple. I even found one inside a souvenir shop! 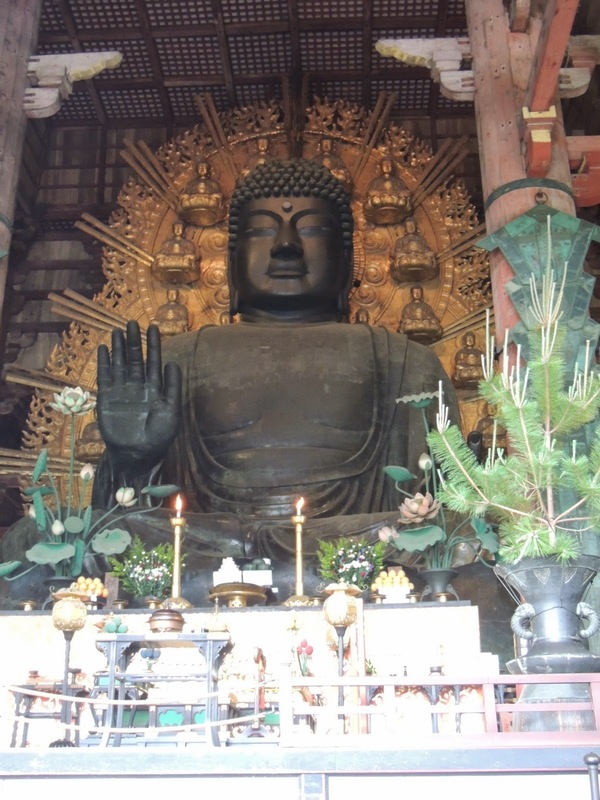 Next, I walked to the Todaiji temple (built in the 8th century) which houses the Great Buddha (locally called the Daibutsu), a national treasure of Japan. I had already seen the Great Buddha at Kamakura, but this one was bigger and of a different color. It was indoors unlike the one at Kamakura. Another attraction of Nara is a five story pagoda which is the oldest wooden structure in the world. Unfortunately, due to limited time (and rain), I was unable to see that. I felt like a complete tourist walking around Nara, taking pictures of things that I didn’t know much about. I missed having my host mum and dad or my professor around to answer all my questions and tell me more about what I was looking at. Still, it was nice to be able to chat with people, since english was spoken quite commonly by tourists and locals alike. I ate udon for lunch at one of those awesome vending machine places (where you chose what you want to eat and pay for it at a vending machine in the front of the restaurant). Udon is supposed to be slightly different in the Kansai region. I think the difference lies in the broth (kansai has lighter colored broth), but having limited experience with udon, I couldn’t tell. Surprisingly, it was served with fried rice (which is strange, since noodle and rice are normally interchangeable food items that aren’t served together). While checking out from my hostel in the afternoon, I met a spanish couple who were travelling around the world. They were on the last month of their travel and said they were exhausted. I’ve met other such travelers during this trip and I’m quite surprised by the large number of RTW (Round the World) travelers.